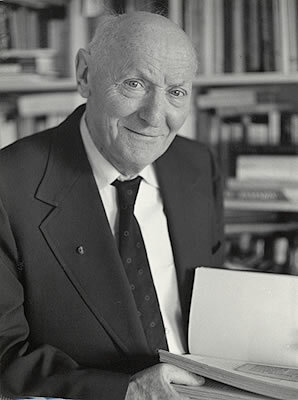 In his introduction to the short story collection Gifts, Isaac Bashevis Singer discussed writing. Readers of his stories would not be surprised by any of the autobiographical bits he gives, but it does provide a useful summary to what he was trying to achieve in his life’s work. Two important points that emerge is that he felt—with good reasons—that he was in a world becoming more insane. The craziness that his characters faced was minor compared to the craziness in the world that created the world wars, Stalinism, and Hitler. “No. The world that was revealed to me was not rational. One could as easily question the validity of reason as the existence of God. 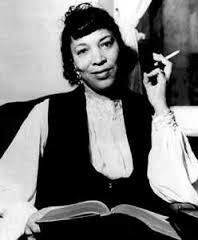 In my own spirit, there was chaos.” (554) In the face of this, Singer chose to embrace writing as a creative act. He discusses at considerable length how he saw God as a writer and writers extending the creative work of God (complete with errors and destructive tendencies). Of course you would need to be a theist to accept the second part of this argument which explains away Biblical nonsense with the trial and error of composition, the idea of witches and dybbuks existing is more rational than fascism and the gulag is worth considering. The second half of The Image and Other Stories carried on many of the same themes from the first half, including fate and show Singer’s revived interest in various aspects of life in pre-war Poland. But for today, I would like to take inspiration from Singer’s introduction to Gifts (also published in 1985) and consider briefly the question of liquidity. In hindsight, this is probably something I should have been saying more about because it so effectively summarizes Singer’s often complicated themes. One of their central struggles is holding onto family, community, tradition, and value in a rapidly changing world. Throughout his stories then we find characters who try desperately to cling to tradition and those who throw up their hands and openly reject those traditions, joining radical groups and embracing the philosophies of the Jewish Enlightenment. Zionists are a bit in the middle. Some seem to truly see Israel as a solution to the problem of liquidity but in a few examples, these characters are just as destructive to family life. “The Conference” puts us right into the heart of the radical community with a 1936 conference of Jewish radicals, communists, feminists, and Zionists. Of course, none of these people are able to get along and they constantly disagree and spend inordinate time revising proposals and minutes until some basic agreement could be made. Very little is accomplished. This is ominous since we know that the right is moving more much active at that time across the border in Germany. Of more interest to the delegates than creating a radical alternative to creeping fascism was a beautiful woman who attended the conference, one of only three women there. 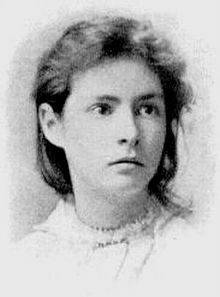 Competition for this one woman paralleled the increasingly vitriolic debates at the conference. Singer is clearly pointing out the inefficacy of the pre-war radicals in Poland. “Strangers” is about an aging Zionist who divorces his wife of fifty years, taking what little property he needed to resettle in Palestine. Right away we notice that his effort to life out a traditional life required him to reject his family and his community. “I want to spend my last years with the Torah and prayer. If I move to the Land of Israel now, my bones won’t have to travel underground to get there when the Messiah comes. I want to breath holy air.” (497–498) After the divorce he moves to Palestine and soon marries a young woman citing the need for a son. Much like the leftists at the conference, this aging Jew turns his personal motivation into what appears to an outsider to be rather lurid. The narrator, observing this as an outsider, finds his own escape to a world going insane saying, “I would run away from home and become a cabalist and a recluse.” (503) Whether it is Israel or mysticism it seems there is a strong element of escapism either as a solution to liquidity or way to flee from it. “Miracles” is a fascinating story of how one man experienced a dramatically changing world as a series of miracles. His escape from Poland, his arrival in France, his survival of the Holocaust are all unlikely. He encounters someone who survived a concentration camp who rejected the role of miracles in life. The solution that is offered up over their conversation is that they are fated. “There are powers up above which play with us. Lately it occurred to me that this earth is ruled by a divine prodigy who toys with little soldiers and dolls. When he ties of them, he rips off their heads.” (480) Of course, an acceptance of fate is yet another response to liquidity and as the story shows it may not mean passivity or clinging to tradition. However, I do not find a satisfying response to liquidity and the upsetting instability and insanity of the world in Singer’s fiction. Actually, it is quite rare to find a satisfying answer to this question and this is something that radicals should always keep on their mind or we will always be fighting the battles of the past. 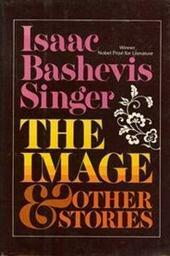 I am continuing my slow slog through Isaac Bashevis Singer’s collected short stories. In order to read through them as leisurely as they seem to demand and prevent it from slowing down my blog too much, I am going to start reading the slave narrative collection. To be blunt, I will be mixing in works that are easier to interpret and quicker to process rather than slow this entire blog down yet again with Singer’s stories. I cannot fully explain why this seems to always happen. I actually enjoy these stories. Perhaps it is their richness that causes my difficulties. They are certainly not straight forward and not conducive to my reckless (let my typos and numerous interpretative errors be forever forgiven) and accelerated approach. 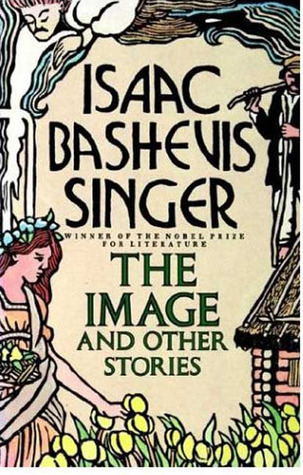 The Image and Other Stories collects twenty-two stories. In a shift from his previous two collections, the stories are less personal. He seems to have exhausted his autobiographical insights. The aging Yiddish scholar, teacher, and writer living out his days in post-Holocaust New York fades to the background. Instead, he returns to the site of his earliest stories: pre-war Poland. It is from this setting that he is able to explore fate and free will. Even stories that are technically set in the post-war world are much more tied to that past. Is this a thematic shift for Singer? His earliest writings was interested in Poland as a means to preserve some folklore and tradition among a Diaspora community. His middle work moved to the personal and results in a series of works of profound alienation, loneliness, failure, and loss. Now I only half way through The Image, but it seems that alienation is gone as we once again find characters deeply tied to communities, traditions, and cultures. The question of fate v. free will is necessarily rooted in this social milieu. Although I am often hostile to traditions, I find that communities can often be the foundation from which individualism emerges. In this I found some common ground with the conservative Singer. But for now I will focus on fate. 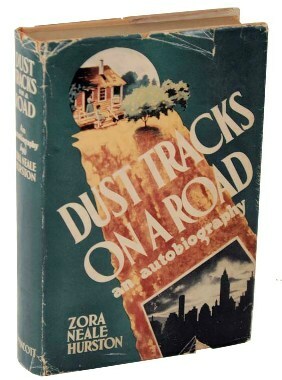 In his brief introduction to these stories Singer wrote: “Man is constantly watched by powers that seem to know all his desires and complications. He has free choice, but he is also being led by a mysterious hand. Literature is the story of love and fate, a description of the made hurricane of human passions and the struggle with them.” (291) We can read fate religiously or mystically but this is not necessary. We are fated in the sense that the vast majority of the things that affect us on a daily basis are outside of our control. The arena were free will exists is incredibly small, but not insignificant. This situation has been worsened in late capitalism with its atomizing institutions, oppressive workplace cultures, and macroeconomic trends that limit our capacity for free choice. Singer seems to agree with this in broad terms. When people do express their individual freedom, the results are often catastrophic. But if fate is a common theme in Singer’s later stories, so is resistance to fate. Fate is often connected to “the Angel of Death” in these stories. This dilemma is explored in the opening story “Advice” about a cuckold husband who falls deeper in love with his wife after she abandons him only to accept her and her new lover under his roof. He becomes a believer that he is fated saying: “When a man stands before the gallows with a noose around his neck and they bring him the good tidings that the execution has been postponed, he does not ask any questions.” (295) The narrator later meets the man and finds that his wife died, her love left for the Soviet Union and he “became king.” While all of this may have also been prescripted, especially his rival’s doom in the Soviet Union, the man starts to take the view that he is wrestling with “the Angel of Death,” not its passive victim. “One Day of Happiness” is a devastating story about a ugly young woman – Penna Fela – who writes a love letter to a celebrity (a general) that she loved. The general invites her for a tryst, taking her virginity and pushing her out of the door as soon as he was done, citing his need to meet a superior officer. Despite bleeding profusely (almost unnaturally) she makes it home. She slits her wrists. While her parents are trying to stop the bleeding the general’s aide comes with flowers. At the end she welcomes death having had her one day of happiness. Now while her doom seems inevitable, she was an active architect. She wrote the letter, sent it, prepared herself carefully for the tryst, and willingly went to bed with him. She is more in control than we perhaps want to admit at the first reading, where we want to condemn the general, obviously taking advantage of the women’s silly infatuation. 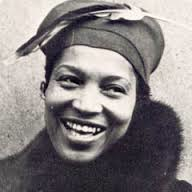 Penna Fela is in rebellion against her family and its expectations and in many ways the active role in the story. I actually imagine the general as more bound, probably unable to refuse a meeting with any woman who writes him love letters. “Why Heisherik was Born” is about a delusion writer who suffers greatly first in the Polish-Bolshevik war and then in travels through the Holy Land. He is poor and barely holding his family together. But he spends much of his time writing, most of it barely literate. He leaves his family to go to the Holy Land and returns with more writings. He asks the narrator to edit his work, which focuses on how he struggled to maintain Jewish rituals despite his situation. We learn later that he died in the Second World War performing an important job as an illegal underground courier. The narrator realizes that he was being prepared for this task by his earlier adventures, giving new meaning to the neglected manuscript. Perhaps his life was simply preparation for his minor role in the war. If so, he was fated to suffer through life. That may be easier to get our head around than one’s freedom to suffer. In these four stories we have people who have chosen to destroy relationships, accept humiliation, or willingly suffered greatly for strange reasons, youthful infatuation, religious devotion, an idea implanted in their mind by a strange vengeful woman. By looking at these figures as wrestling with fate rather than being passive servants, even the fatalist can find room for free will even if it is only in resistance to predestination. Continued from the last post, in which I tried to show that we can, along with Mark Twain, be inspired by Joan of Arc as an example of a young person being given massive challenges and creating the new values required for the age. In Twain’s account, Joan of Arc transformed cynicism into optimism, shallow symbolic religion for religious passion, while also destroying the existing political and social status quo. In a sense, Joan of Arc is a larger and historically significant example of Huck Finn, who also successfully faced the most profound challenges of the day. I also argued that perhaps the best thing that elders can do is understand that their values are decrepit (which does not mean they did not have their value at one time) and step aside, in the process liberating the creative power of young people. Most importantly we should stop educating them in our fashion, in our institutions. 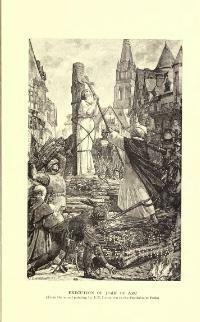 The second half of Mark Twain’s The Personal Recollections of Joan of Arc, covers her military campaign after the victory at Orleans and her martyrdom at the hands of the conservatives in her own ranks and the English. Mark Twain argues that her victories emerged from her vernacular knowledge, her peasant background. The nobility could not save France because they simply did not understand France. “How did she know it? It is simple: she was a peasant. That tells the whole story. She was of the people and knew the people; those others moved into a loftier sphere and knew nothing much about them. We make little account of that vague formless, inert mass, that mighty underlying force which we call ‘the people’—an epithet which carried contempt with it. It is a strange attitude; for at bottom we know that the throne which the people support, stands, and that when that support is removed, nothing in this world can save it.” (790) This is perhaps not a justification for monarchy in the end, but to the degree that one of Joan’s successes was the coronation of the King and the solidification of the political force that would win the war against the English, she at least moved that monarchy into a democratic direction. Unfortunately there are too few rectifications of the people with the rulers (revolutions, they are typically called). Mark Twain presents the trial of Joan of Arc as yet another of her triumphs due to her ability to out-maneuver her accusers. The claims of heretical transgression centered on a handful of issues: her apparent direct contact with God (he took messages from “The Voice”) and her cross-dressing and her preference of wearing men’s clothing and armor. Under the surface are claims that she was misusing the French people for her own aims, lying to them to achieve victory or using some form of witchcraft to achieve unnatural victories. According to the narrator, the real reason for the trial was purely political and strategic. The English simply wanted to remove an obstacle to their war effort. By the narrator’s account the trials ended with Jean victorious, especially when she demanded a trial under the direct supervision of the Pope, rejecting the arbitrary local law for a more universal concept of justice. There is much in this trial that reminds us of Anne Hutchinson’s trial in this regard. 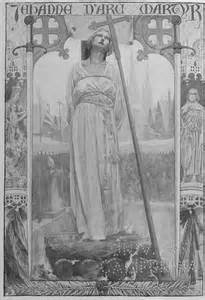 After Joan of Arc is executed, she becomes a commodity to be used by others for political advantage. Until France was finally liberated from the English, the King ignored her. With victory he worked to “rehabilitate” her image so as not to be accused of earning his crown through the efforts of a women in league with the devil. So, the second part of this tale is not without its victories for Jean, but these victories are in the broader context of betrayal. Perhaps this was inevitable. For all of Jean’s amazing achievements, she chose to work within and respect the political and religious systems of her time. Her revolution was a half-measure. She temporarily reconnected the French people with the crown. She oversaw the rise of a more vernacular and popular peasant Christianity. But since she never challenged those institutions, she was left vulnerable to betrayal. Institutions privilege self-preservation over justice, honor, and progress. 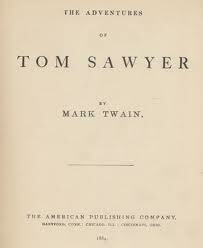 Around the time this book was published, Samuel Clemens’ daughter Susy died. I cannot help but wonder if he saw some of Joan of Arc in his daughter. 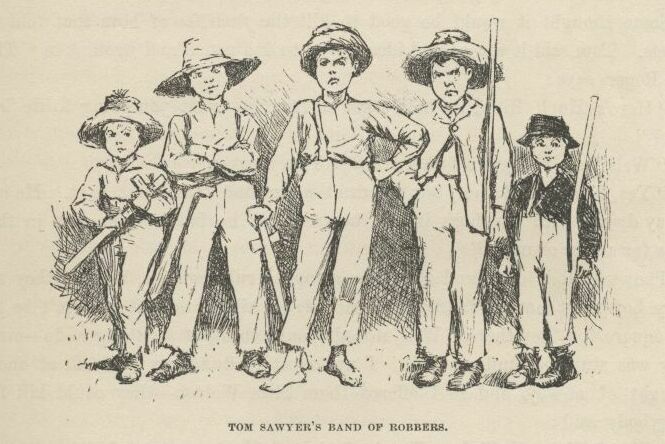 That the main plot of The Adventures of Tom Sawyer is about children pretending to be robbers and praising the accomplishments of robbers while also engaged in a real serious life and death battle with a real robber, totally odious in practice with none of the nobility imagined by children, is very significant. Tom and Huck can play robber, but when they encounter a real robber, they face him with maturity, courage, and nobility. This tells us that Mark Twain did not believe that the line between play and reality was that far. Play did not create a false vision of the world, even as it did allow for playful imagination. We can believe that Tom and Huck after meeting Injun Joe still believe that robbers could be heroic and noble Robin Hoods. In fact, we know this is true because Tom recommits himself to being a robber even after becoming rich (even if that is to scam Huck into staying with the Widow Douglas). The adult worlds and the creative constructions of young people are mostly separate through the first half of the novel, but they become increasingly intertwined and combined in the second half. One example of this is the introduction of the summer activities to St. Petersburg, which brings, momentarily, a childish spirit to the entire town. A black minstrel show, the Fourth of July celebrations, a circus, a phrenologist and a mesmerizer all came in turn and “left the village duller and drearier than ever” when they left. By and large, it is the children who are forced into adult responsibilities, fears, and troubles. The murder trial of Muff Potter was the first time in the novel when Tom Sawyer was given a truly adult responsibility. The burden was on him to defend Muff Potter’s innocence. Of course to do so meant witnessing against Injun Joe, who sat in the audience looking fearsome. Although this made him a town hero, he remained in perpetual fear of Injun Joe. “Injun Joe infested all his dreams, and always with doom in his eye. Hardly any temptation could persuade the body to stir abroad after night fall.” (148) While most of us, I hope, enter adulthood without such a traumatic experience, fear is a component of that transition for most. Fear of money, fear for safety, fears of eternal loneliness. These are all ways that we are brought into adult responsibilities of college, careers, marriage, and saving. Despite this, Tom is able to defend his freedom in the face of the pressures of creeping adult responsibility and he embraces them with greater seriousness and stoicism. This is what makes his assurance to Huck at the end of the book that he remains committed to being a robber feel so tragic. If he does grow to be a robber, it might very well be as a land speculator…although we do not share such fears for Huck. 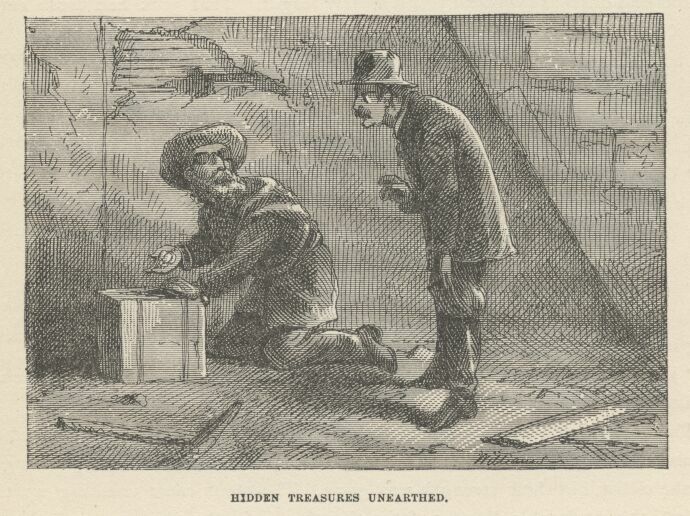 We already see in Tom some attraction to wealth that seems to be lost on Huck, when he looked on Injun Joe’s “treasure.” “He never had supposed for a moment that so large a sum as a hundred dollars was to be found in actual money in any one’s possession. If his notions of hidden treasure had been analyzed, they would have been found to consist of a handful of real dimes and a bushel of vague, splendid, ungraspable dollars.” (165) We can appreciate this childish approach to money (especially when people today hoard wealth that is literally inconceivable). There is some end to Tom’s innocence when looking at the wealth. It is clear from later passages that he wanted that treasure. Both of the young boys get their chance to become local heroes, but again we find a different between the two. Huckleberry Finn’s heroism is anonymous as he informs on the actions on Injun Joe to the Welchman. Tom is more famous as he saves Becky from their (quite scary) adventure of being lost in a cave occupied by Injun Joe, at his final hideout. After his escape he did not tell about noticing Joe there, an oversight that had tragic consequences. Tom’s role in killing Injun Joe needs to be addressed as part of his more harsh entrance to adulthood. Huck will enter adulthood through a moral question. Tom’s entrance to adulthood is shaped by violence and the acquisition of wealth. 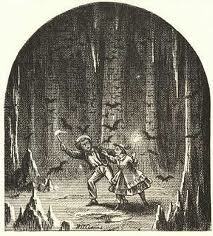 For two weeks, Tom did not mention bumping into Injun Joe in the caves. During those two weeks, the people of St. Petersburg locked the cave shut to prevent other children from getting lost. Only then does he tell the adult that Joe was there. Twain’s description of Injun Joe’s is one of the most horrible descriptions I have ever read and it has stayed with me for years. 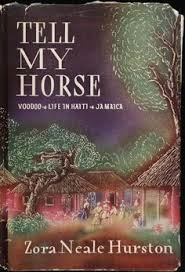 It conveys not only the horror of his death but the isolate that helped create Injun Joe and the insignificance of a single human life in the context of time. In the final scene, Tom tricks Huck into becoming civilized. He perhaps does not know that civilizing Huck would end what Tom and the others of the town so admired about Huck. Tom perhaps just wanted him around him as a friend. He uses the attraction of a robber gang to convince Huck to be adopted by the Widow Douglas. In a way the final dialog between the two is a battle between adulthood and childhood, civilization and freedom. Welcome to the adult work Huckleberry Finn. I am glad you see it my way.